Tucked behind our retail shop is a real hidden gem – our Fern Garden. 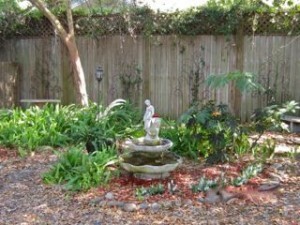 This quiet garden is perfect for small, intimate events – birthday parties, tea parties, cocktail parties, receptions, rehearsal dinners, family reunions, bridal/baby showers. The basic rental fee for a 4 hour party, including up to 5 round tables, 2 banquet tables, and white chairs (up to 40) is $150.00. You can bring your own food and decorations, or you can let our designers & caterers plan and execute the full event. 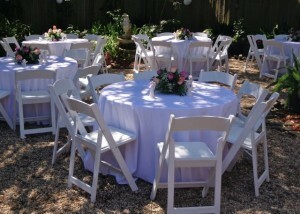 Email or call for more information and to get started planning your next event in our lovely Fern Garden.